Discount travel along Michigan's west coast. Discount travel does not mean substandard choices on flights, cars, or by staying at one of the cheaper hotels (affordable accommodations) gives you more options. Use the savings for a romantic meal at one of the many fine beachtown restaurants. Maybe a special piece of art that reminds you of your time together, along Michigan's scenic west coast. Most of the large chain hotels and motels are located close to, or in the beachtowns along Michigan's west coast. The major chains have really jazzed up their facilities along this coast and you'll enjoy plenty of comforting amenities. However, if this is a special event such as a wedding, honeymoon or anniversary ... and money is no object, then by all means live it up. Go to one of the big resorts. It will be money well spent. Many big resorts will normally offer "two for one deals" during the off-season. Lake Michigan is so beautiful year-round that we often take advantage of those seasonal offerings. itravelnet.com Destination Travel Guide Worldwide travel and tourism information destination guides. Find the best travel deals for your romantic getaways. 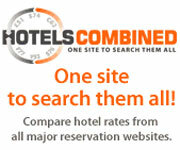 Hotels Combined is a unique free tool that searches multiple hotel reservation websites simultaneously so you find the lowest rate. This free comparison service saves you time and money! Thrifty has over 1200 locations for you to rent cars at really good rates. Hotwire is a very popular travel search engine for discounted flights, hotel rooms and rental cars. Unlike others, they never ask for your credit card until you are ready to buy. Traveling and saving money, without sacrificing comfort, is always something that makes us feel good. Don't forget to check out our other pages on Michigan Inns, Hotels, Bed and Breakfast and Vacation rentals. From Discount Travel Back To Home.